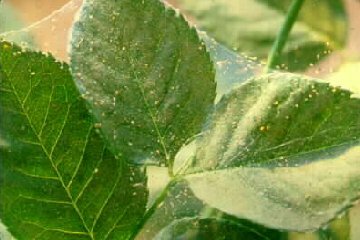 Spider mites on outdoor plants is a common problem. Spider mite damage can not only make a plant look unsightly, it can even kill the plant. Therefore, it is important to use a spider mite treatment as soon as possible on an affected plant in order to keep the plant healthy. There are many species of spider mites. Many are specific to a particular plant or family of plants, others can feed on a wide range of plant hosts. 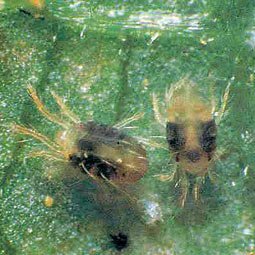 The most common spider mite may be the two spotted spider mite. They feed on a very wide range of plants including many flowers and vegetables. Most types of spider mites feed on the under side of leaves, sucking the juices out of individual cells, leaving an appearance of tiny dots called stippling. Hot, dry conditions are often associated with population build-up of spider mites. 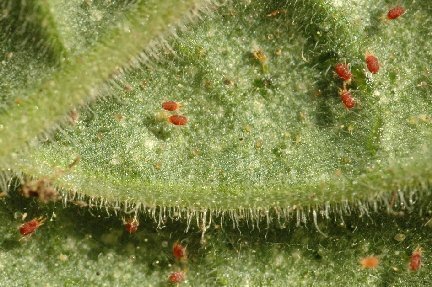 Under optimal conditions (approximately 80 °F), the two-spotted spider mite can hatch in as little as 3 days, and become sexually mature in as little as 5 days. One female can lay up to 20 eggs per day and can live for 2 to 4 weeks, laying hundreds of eggs. This accelerated reproductive rate allows spider mite populations to adapt quickly to resist pesticides, so chemical control methods can become somewhat ineffective when the same pesticide is used over a prolonged period. Most mites winter over as adults, emerging and laying eggs. The larvae hatches out and feeds, it only has 6 legs. Then they go through 2 nymph stages before becoming an adult, with 8 legs. Spruce Mites are a cool season mite that attacks spruce, arborvitae, and junipers. As hot weather approaches their activity decreases. Unlike other spider mites, spruce spider mites lay eggs in the fall that won’t hatch until the following spring. Other spider mites stop laying eggs by late summer but clusters of the spruce spider mite’s red “winter egg” can be found on stems and needles during winter months. Winter eggs can be effectively controlled by late winter applications of horticultural or dormant oils. Spider mites have many natural enemies, but other mites, called predator mites, are the most important. Lady beetles, syrphid flies and lacewings also are good predators of spider mites. Some insecticides kill more of these natural predators than the spider mites. Most systemic insecticides do not control spider mites. 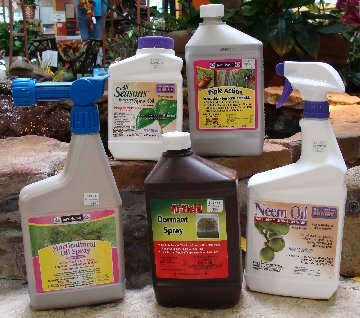 Fertilome Horticultural Oil Spray is a good product to use in the control of spider mites. This product is not like other dormant oil or horticultural oils. There is no temperature restrictions on this product as on other oil sprays. Another choice is Fertilome Triple Action. It contains neem oil and is a very good natural choice. You should not use it in temperatures over 90 degrees, however, because it can burn the plants. During dormancy, Hi-Yield Dormant Spray is slightly more effective on over wintering adults and eggs. Dormant spray is designed to be used during cold, dormant seasons when there is no threat of burning the plant.